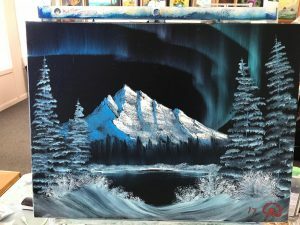 During ‘The Joy of Painting’ Bob Ross often talks about his friends and students and about what great painters and instructors they are, especially his son Steve. 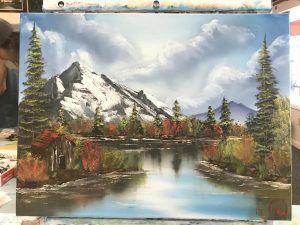 But did you know that almost everyone can become an instructor for the Bob Ross painting method by visiting a Bob Ross Instructor Course? All you need is the desire to paint. 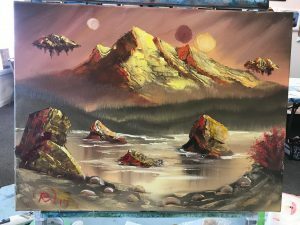 Bob Ross Inc. offers several courses that aim to teach you how to be a better painter and a great teacher and continue the legacy of Bob Ross. 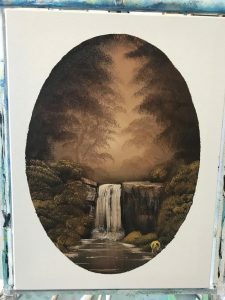 After finishing you can call yourself a Certified Ross Instructor and spread your love for creating beautiful paintings to the world. People (CRPI, Certified Ross Portrait Instructor). Each of these Teacher Training Seminars consists of three levels, each one building on the one below. Level 1 provides a strong foundation in painting your desired subjects and places special emphasis on the proper use of the different available tools. In Level 2 you will work on more advanced projects and start honing your skills as a teacher. Level 3 is the final step in becoming a Certified Ross Instructor and does not only feature advanced painting techniques but also teaches you everything you need to know to become a successful teacher, from demonstration skills to product sourcing, class setup and even promotion. 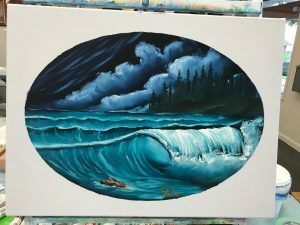 “As a child of an art teacher growing up I always connected with Bob Ross. His mellow voice and supportive words always felt right at home watching him paint. So fast forward a few decades to me being a painting teacher myself at an art gallery it only seemed logical to learn the technique that inspired me so long ago. Bob Ross was more than an artist to a lot of people. He was a mentor, a teacher, and a cheer leader for those who couldn’t believe in themselves. 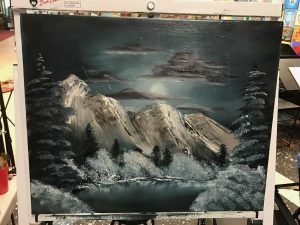 I went to the Bob Ross certification with only 6 months of oil painting under my belt. Most of what I did in the medium was my best attempt at doing what he taught in his videos so long ago. While he makes it look easy, Bob had a technique that he learned from William Alexander that was quick and effective. He took that technique and turned it into an amazing system of supplies and knowledge. While he looks like he’s just poking the canvas with the brush, there is so much more going on. Whether it’s the amount of paint used or just the pressure and direction of the bristles against the canvas. The greatest thing I’ve learned from his technique is that with these tricks anything is possible, there really are no mistakes. In a world where everything is certain and forever, the style leaves room to be adapted to and fixed in any capacity by artists from beginners to the most experienced. The course taught me all these lessons, and that there is always more to learn. With enough practice anything is possible, it’s our world so we can sculpt anything we envision. Below you can see Grant’s progression during the course, with the first painting done before starting and the other ones during or after finishing the CRI course. If you have any questions about the courses or want to tell us about your own experiences visit us on Twitter @2InchBrush. Waar zijn de cursussen in Holland ? I live in Mexico and would love to consider being a Bob Ross Instructor here in Ajijic and Chapala. I am a retired US citizen and find that this would be great here, the scenery and weather are very conducive for this. I have a Art Certificate from Maryland Institute College of Art. Many times I have volunteered to instruct children and people in nursing homes. Would you please let me know how to go about becoming an instructor. Are there any courses being given in North East Ohio. I live about 45 miles SE of Cleveland.